by Bret Hesla and Richard Bruxvoort Colligan. 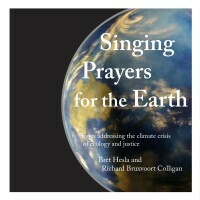 About this project: ​We set out to create what we find missing in our communities of faith: songs and hymns that address the many faces of the climate crisis, including its links to injustice in other forms. The songs in this new collection, all meant to be sung in community, name our fears, lift up our hopes, dream about our future, and renew our commitment to walking lightly on this wonderful planet. The songs range from full length hymns to short refrains intended to be used in an antiphonal style, alternating with spoken prayers, litanies and poems. Recording Credits: Thanks to all the wonderful and generous musicians, readers and friends who contributed to the recordings. 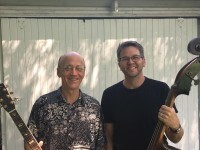 About Bret and Richard: Bret Hesla is song leader and composer committed to group singing on progressive issues of justice and faith. He leads singing in faith settings and also leads community sings for the wider community in public parks. He lives in Minneapolis, Minnesota. Sing the songs: These are songs meant for group singing–in worship, in community gatherings. Create services, liturgies, program ideas and other ways to use the songs: Maybe you can find ways to string two or more of them together into a longer liturgy or program. Let us know what you come up with, and we’d love to share it with others. intersperse with the shorter songs, to model how to use them. You will have other ideas for readings addressing topics important to you. Let us know what you come up with, and we’d love to share it with others. Give us feedback: new verses, other songs that need to be written. We look forward to hearing and singing your songs, too. Ultimately, we hope the singing can play a role in our multi-pronged work to change how we all live and work and play as we move toward a sustainable world.